Rob White is the sole Director of MPV Consulting. It has been Rob’s aim to improve the standard of management in veterinary practices and has successfully been a heavy influence in what has developed for day to day practice management changes over the past 20 years. Whilst practice management software is an important tool of management, there is a growing trend for veterinarians to depend more heavily of practice management software to “do their management for them”. The fundamentals of good business management start with the practice owners and managers who in turn make proper business strategy and directional decisions. He believes that owners and managers should be expanding their scope to use the ever widening variety of tools that are available to them to help them achieve their goals. 1991 – VetAid Veterinary Practice Management Software – was a co-founder of VetAid Practice Management Software and VetAid Pty Ltd. 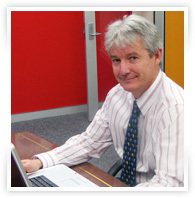 Rob took sole responsibility for the sales and marketing of the software with assistance in software capability design. By 1996 over 600 veterinary practices were using the software representing over 33% of all veterinary practices in Australia at the time. 1993 – VetAid Stationery Supplies (now Veterinary Stationery Supplies) – was the co-founder of VetAid Stationery Supplies that was set up with the purpose of providing general and specialised stationery to the veterinary industry. VSS is now the major supplier of stationery products to the veterinary industry in Australia. 1998 – Visual VetAid Veterinary Practice Management Software – VetAid Pty Ltd released Visual VetAid Software as the most advanced veterinary software packages of the day. Rob’s tasks were to advise on features to be used in the software and be solely responsible for sales and marketing of the software. 1999 – Visual VetAid UK – in 1999 Rob moved to the United Kingdom for 18 months to establish the UK office for Visual VetAid. This was the first step of the company to become a truly international software package. After RxWorks was formed as the new company he remained in the UK to ensure the product was well established prior to returning to market the Australian office. 2001 – RxWorks – was a co-founder and current shareholder in RxWorks. In that year he returned from the UK to become General Manager of the Asia Pacific arm of the company. During the period RxWorks became the dominant veterinary practice management software used in Australia and was also distributed in New Zealand, Holland, UK and Asia. 2005 – Master Business Administration – began an MBA course majoring in marketing with the purpose of further expanding knowledge on marketing and applying it to veterinary practice. 2005 – MPV Consulting – Rob created a commercial organisation with the primary purpose of introducing true business and marketing technique to veterinary practices. This has been in the form of direct help to practices, educational lectures and groups and use of other tools to keep veterinary practices both aware and informed of marketing methods. 2008 – MyPetsVet Bald Hills – by 2008 Rob had achieved what he set out to do with his veterinary practice. It has sustained for the first 3 years an annual compounding growth rate for the practice of 29.95% in a densely veterinary populated area of Brisbane. This was achieved using the business principles which he believes in so strongly. Whilst Rob expects the practice to keep growing he does not expect the level of growth to remain quite so high. 2008 – MPV Consulting – the company is a well established consultancy company within the veterinary industry. Over 950 practices Australia-wide have utilised services offered by the company since its inception. MPV Consulting now provides multiple survey opportunities for practice owners, delivers educational seminars, provides a lower cost practice self-evaluation appraisal service, provides management and marketing advice and provides newsletter to veterinarians Australia-wide on business related topics. MPV Consulting has extensive plans for future service development. 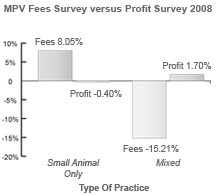 The MPV Fees and the MPV Profit & Expenses Surveys in 2008 have shown that whilst Small Animal Only practices charge fees that are notably higher than those in Mixed practices, the reality is that overall Mixed practices, on average, are more profitable.